Deep learning has contributed to recent progress in the fields of speech and natural language processing. The Microsoft Cloud and AI division conducts significant research and development in these areas. I will start with an overview of these activities and their applications in a range of Microsoft products and services: Cortana, Office, Speech-to-speech translation, and HoloLens. Third-party services can access these technologies through Azure Cognitive Services. Designing systems to meet specific requirements posed by such diverse applications is a challenge. I will explore a few of these challenges and solutions, using contextual speech recognition as an example. Finally, I will indicate the various research internship and full-time employment opportunities Microsoft offers for graduate students with relevant background in speech, NLP, and machine learning. Partha is a Principal Scientist in the Cloud and AI division at Microsoft. His current interest is in deep learning and its application to speech and natural language processing. He has previously worked on gesture and speech technologies for conversational multi-modal interactions, in the Conversational System Research Center. 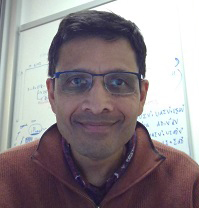 Prior to joining Microsoft in 2010, Partha spent three years working on problems in computational advertising at Yahoo Labs. He spent most of his research career at AT&T Bell Laboratories and its successors, contributing to advances in many areas of speech processing including articulatory modelling, automatic speech and speaker recognition, and multimedia processing. Please register so that we may plan lunch accordingly. Register here.